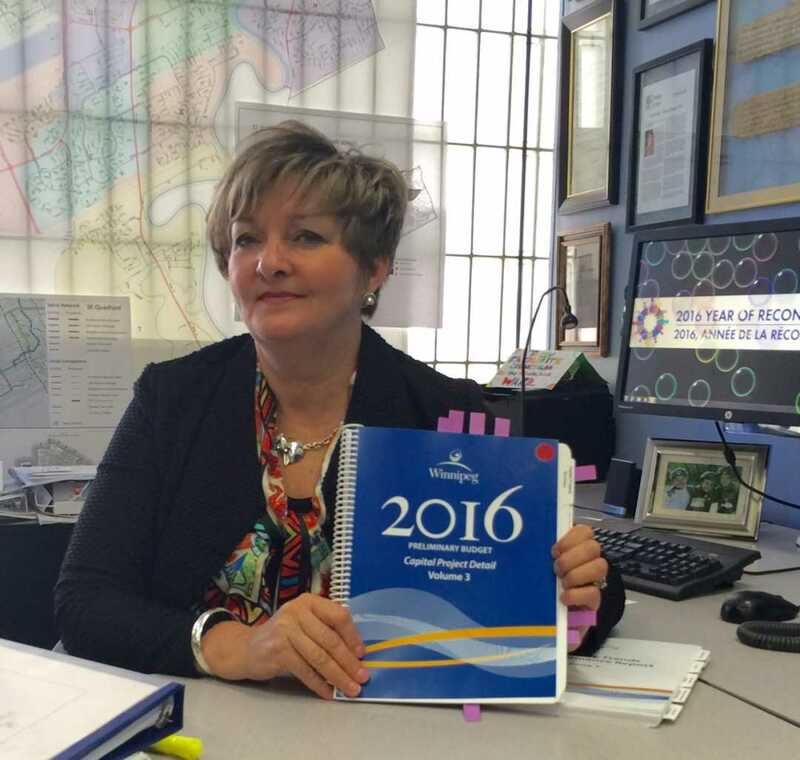 The transit overview in the 2016 preliminary budget offers some very positive highlights and some ongoing challenges faced by Winnipeg Transit. Emission control devices on new buses are a recent, mandatory requirement under Federal Government legislation. However, these devices have resulted in increased costs for maintenance staffing as well as repair parts. This in turn has delayed the purchase of new buses (with the same emission control devices) as well as the hiring of staffing for route expansion. At the suggestion of the engine manufacturer (Cummins), Winnipeg Transit is replacing the entire emission-control system with new units. While the original warranty had expired, the manufacturer offered a discount on the price of a replacement unit. This affects 101 New Flyer buses purchased from 2011 to 2013; emission-control systems repeatedly broke down even after repair. Additional Info: CUMMINS RECALL CAMPAIGN NUMBER IS C1154.NEW FLYER’S RECALL CAMPAIGN NUMBER IS R11-019.OWNERS MAY ALSO CONTACT THE NATIONAL HIGHWAY TRAFFIC SAFETY ADMINISTRATION’S VEHICLE SAFETY HOTLINE AT 1-888-327-4236 (TTY 1-800-424-9153), OR GO TO HTTP://WWW.SAFERCAR.GOV . No additional operating funds (for drivers) have been allocated for service expansion because we are not purchasing buses. It’s a good sign that service expansion buses are in the 2016 budget, but purchasing (approx. 80 buses) is being delayed in both 2015 and 2016 budgets until the emission control challenges are rectified. Winnipeg Transit retires an average of 30-35 buses annually. Projected bus purchases for the next six years average 30-35 annually. The current projections do not include bus purchases for service expansion; yet, the city is growing along with a growing transit ridership (2019 budget includes an additional 12 buses for operation on the Southwest Rapid Transitway). In the short term, we are not able to grow our service until the emission control challenges are rectified. I along with many other members of City Council are supportive of expanding transit service, and will continue to work towards that goal. No new buses are being purchased yet from the 2015 budget allocation. The timeline for new buses averages 9 months from ordering to delivery. The City is exploring the availability of purchasing used (pre-2010) buses from other municipalities to support the anticipated uptake for the U-Pass service expansion. These pre-2010 buses are models that do not have emission control challenges. Winnipeg Transit runs an extraordinarily efficient maintenance shop and is able to service buses without emission control devices more cost/time effectively as compared to new buses with the emission control devices. Winnipeg was one of the first cities which purchased buses with the new, legislated emission control devices between 2011 and 2013. As a result, we are also one of the first cities to experience the challenges related to these devices. 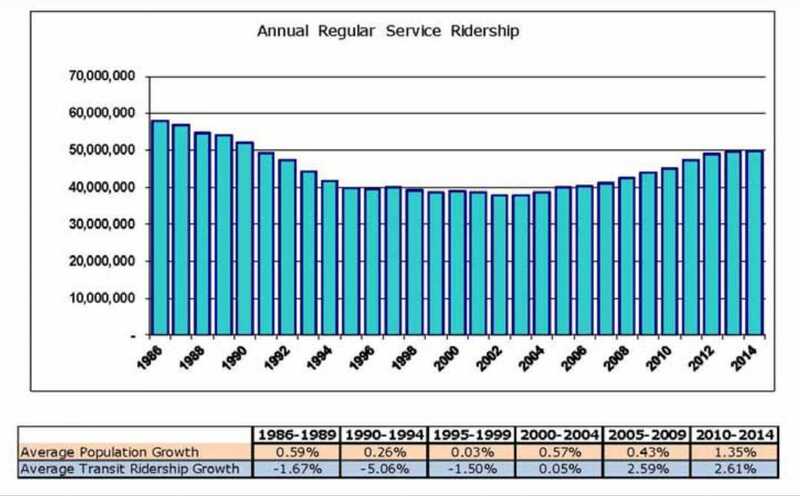 We are seeing a ridership rate of growth faster than the rate of City of Winnipeg population growth. 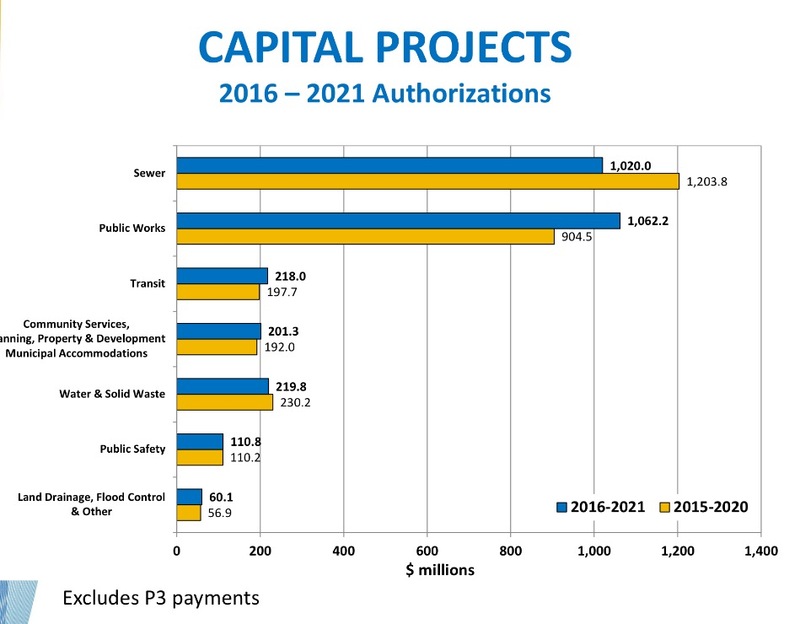 The graph below represents authorized Capital Projects for the period of 2016-2021 excluding the Rapid Transit Corridor and other projects. Other: Winnipeg Transit has advised there are four additional routes across the City which currently meet the criteria for expansion. Cost of Bridgwater/South Pointe Routes 72 and 84/86 – $1.6 million approx. In 2016, the service plan has an estimated increased cost of $200,500, offset by increased revenues of $140,000 (includes increased passenger revenue of $79,500 and increased Provincial funding of $60,500, based on Transit’s cost sharing agreement with the Province). To maintain existing frequency/headways, two additional vehicles would be required (one for each route) at a total cost of $1,180,000 (2016 dollars). Currently, there are no new buses being purchased for route expansion due to ongoing emission control challenges. The good news is the funding to purchase buses is included in the 2016 budget. The challenge is that no operating funds (for drivers) have been allocated in the 2016 budget, because of the ongoing challenges with the mandatory emission control device. New buses are ‘anticipated’ to arrive in late 2016 or early 2017 BUT this timing is dependent on whether or not a successful resolution is found by the manufacturer for the emissions control device.